In the Pisces and Leo love compatibility both will enjoy the new view on life they can show each other. The Leo star sign will be strong and assertive. The lion will have the independence to do what they want. They will be able to take control of the situation around them. The Pisces sun sign will be more soft and withdrawn and introspective. They will be very opposite of each other. However, they will both be dreamers at heart. When they are in love, they will be able to give each other what they are lacking on their own. The Pisces Leo relationship will be caring and will benefit them both. The Leo personality will be a natural leader. When they are in a relationship with the fish, they will likely guard over their weaker partner. Pisces will easily be able to give the lion the audience they need for their motivations and social performances. The Pisces personality is like water and will fill whatever container they are poured into. The fish will give everything they have in a romantic relationship. They will have a kind heart that will let them know the lion in a way that other zodiac signs will not be able to. The Leos can be very direct. These traits mixed together will not have the lion being selfish like they might alone. The fish will not be shy like they might be alone. Pisces is a Water sign. Leo is a Fire sign. They can be very happy and progressive with each other. However, they will both have to recognize each other’s needs. The fish and the lion will use introspection and creative motivation to take care of matters of the heart. Pisces can teach the lion to be humble and to think about other people’s needs. Leo can teach the fish to go out into the world and to lighten up some. The Pisces born can be overly emotional. Because of this, they can hurt the Leo’s enthusiasm. However, too much Fire can boil away the Water. Because of this, the lion can leave the fish feeling emotionally burned. Pisces and Leo in love will have to learn to communicate with each other in an effective way to keep their relationship balanced. The best thing about Pisces Leo love compatibility in a romantic relationship is how they will both be receptive to each other’s teachings. The fish can show the lion how to be more sensitive and caring. The lion can teach the fish to make their dreams reality instead of just thinking about them. They will both be able to give each other what they need. The Pisces Leo friendship will be a relationship that will benefit both of them. The fish and the lion will likely be fascinated with each other when they meet. Because of this, they will likely be very attracted to each other. Leo is attracted to Pisces’ ethereal aura. Pisces is attracted to Leo’s strength and confidence. Their star sign compatibility will likely be very romantic. The Leo man or Leo woman will sweep the Piscean off their feet. Pisces will be sensitive and surround the lion with love. They can have a courtship that has a lot of magic. The Pisces man or Pisces woman will be infatuated with everything that the lion will seem to be. Pisces is a Mutable sign. Leo is a Fixed sign. The fish will not work well as the leader of the relationship. They will be happiest when they are making the world and the universe a better place. However, they will want to start with their partner. The lion will think of new ideas. They will suggest little things that should change in the Pisces Leo relationship. Pisces and Leo marriage might be a successful relationship. They might be able to understand each other and let them both shine in their own way. Pisces will completely trust their partner. Leo will take that responsibility seriously. They will not be likely to hurt the fish on purpose. At the same time, lions are regal and have a lot to learn from the gentle fish. The lion will learn from the fish how to be spiritual. If the Leo male or Leo female can see this, they will have more respect for the Pisces. Because of this, they will be more compatible. They can have a relationship that is very creative, mysterious, and almost other worldly. They will both be able to benefit a lot from each other. The Pisces Leo love compatibility might be challenging. They will both need to learn a lot about each other. The fish and the lion will have a zodiac compatibility that is somewhat uneven. Leo is the royal of the zodiac. They will demand encouragement from their partner. Pisces is the dreamer of the zodiac. They are gentle and will need their own encouragement. They will likely be lost in their own world too much to give the lion the adoration that they want and need. Leo men or Leo women have a strong personality. Pisces might find it intimidating. The fish and the lion can be compatible but it might be complicated. They can have a love compatibility that is as great as a fairy tale. At the same time, they can have compatibility that is a nightmare. The Pisces and Leo in bed can have a very steamy relationship. They will both be seductive and have an intense magnetic attraction. However Leo’s fire can boil away Pisces’ emotions who can be very hurt by this. The fish can be needy and overemotional. Because of this, they can extinguish the warmth of the lion. Leo will be drained of all their sexual energy and excitement. Pisces and Leo soul mates can hurt each other’s personalities if they are not compatible. 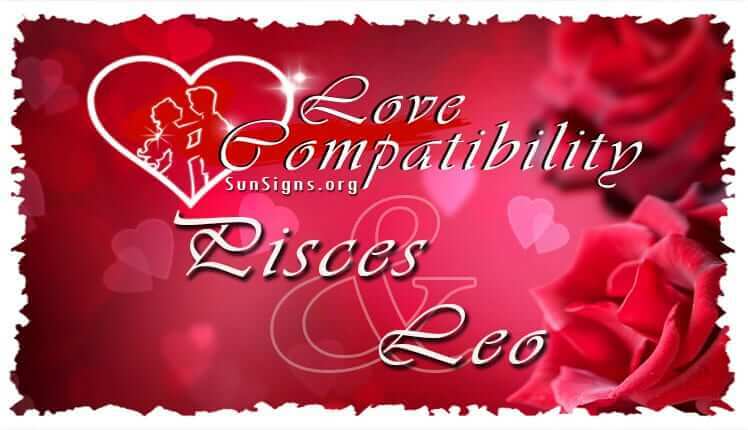 Pisces and Leo in love might find it hard to be compatible when reality sets in and the romance is not as strong. They will both want a different social life. Pisces likes to have more privacy. Leo will like to have a lot of attention. They will both work on different emotional levels. The lion is open and will display their emotions. The fish might feel overwhelmed and will find it hard to express their emotions. Because of this Leo men and Leo women will be likely to display all of their feelings. Pisces will be likely to withdraw and not communicate. This will make the lion angry. When they are angry, then the fish will withdraw more. They will both have to work hard to break the cycle or be prepared for a Pisces Leo breakup. The planets Jupiter and Neptune will rule over Pisces. The sun will rule over Leo. It symbolizes the self will bring light and life to the relationship. Planet Neptune will be concerned with overall pictures, ideas, and illusions. However, they will be concerned with disillusion and fantasy. Leo will be able to help Pisces make their dreams into reality. The planet Neptune will work with Pisces to help soften the lion’s selfish nature and sudden actions. They will focus the energy into a more creative and productive outlet. Pisces is ruled by planet Neptune which is the planet of illusions. Because of this, the fish will find it easy to live in a fantasy world. Leo born will be grounded in reality. However, they might want to talk about things if they can avoid a fight. They will both need to communicate with each other if they want to have a strong Pisces Leo compatibility and a successful relationship.